Aimed at the professional market, the EOS-1 is notable for being a major game changer for Canon. For the first time ever, Canon's standard USM lenses offered better focusing performance than Nikon's professional lenses on the then-inferior Nikon F4. EOS-1n (1994), with improvements in focusing system and various iterative improvements. 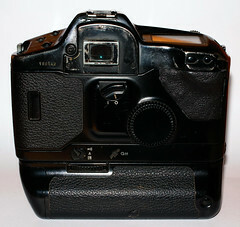 EOS-1n RS (1995), with a pelicle mirror similar to that of the EOS RT and older Pellix. EOS-1v (2000), the final version, and the fastest SLR camera with a moving mirror. 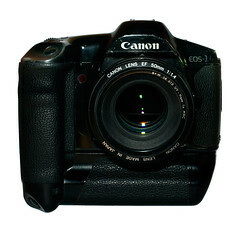 The EOS-1N is an improved version released in 1994. It was sold in combinations called EOS-1N DP which is the body and BP-E1 (LR6/AA) battery pack and the EOS-1N HS is body plus booster which increase the transport speed and can house both (LR6/AA) and 2CR5 batteries. The EOS-1N RS is a pellicle mirror version released in 1995. The last in the series, the EOS-1v was still in production at least as late as 2010, making it one of the longest production runs for a camera in recent history. According to Canon, they ceased production of their last film cameras, including the EOS-1v sometime prior to January 2011, however new stock from the last production run remains available through Canon camera dealers as of 2012. 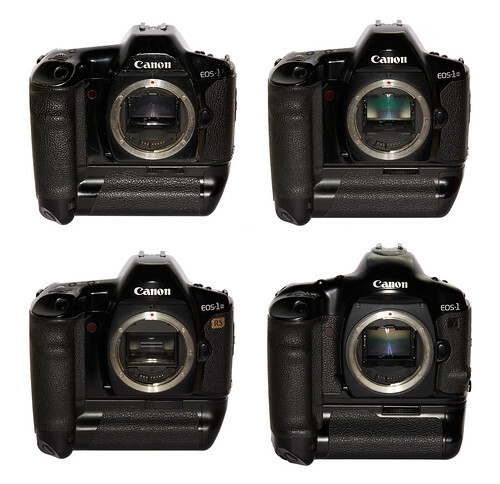 Its digital successors include the EOS-1D Mark I-IV, themselves very heavily based on the 1v. Shutter speed 30 sec to 1/8000 of a sec. Manual; 6 to 6400 ISO. ↑ Photo.net forum: Will EOS-1v be the last film SLR? ↑ Flickr ishootfilm forum: Are SLRs still being made? This page was last edited on 11 October 2018, at 05:28.